When we last left our heroes, Gordon was tricked into a case involving a serial killer who goes after the loved ones of any cop who gets too close to solving his crimes, and even when he found this out he continued his investigation into Milo Ventimiglia’s Ogre. We also get a little bit further into the plots of the Penguin, the Bat and the Cat, and the Riddle Man. It’s one of the darker episodes on several fronts and I generally enjoyed it. There’s even the return of Barbara who gets to show a little bit more bite to her character that has been severely lacking in this show from the very beginning. Hopefully she either bites it, or comes into some serious character growth because that has been one of the many missteps this show has taken from the start. And sadly, we don’t get to find out the fate of poor, poor, Fish Mooney who was left with a possibly fatal injury while escaping from the island of Dr. Mor-err-Dollmaker. I’ll start with one of the characters that has been a little bit hit or miss, but I’ve thought has shown some great potential on a slow build to villainy. Mr. Edward Nygma, the riddle man as the substitute for Detective Flass has so lovingly named him. 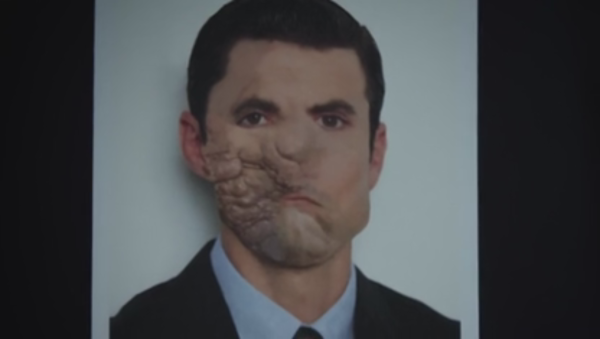 He’s been shown to have a dark side to him once already when he framed the previous medical examiner with some stolen body parts, and while there are some fun touches to his character in the earlier moments of the episode, I think they pushed him a little bit too far too quickly. He’s at his best when he’s shown to be both endearingly ineffectual at times and yet still incredibly resourceful. And that was played up well both when he was comparing stab wounds on watermelons and when he turned those watermelons into an intricately cut melon bowl as a present for Ms. Kringle. But at the end of the episode he has already stepped over the line into villainy as he puts that stabbing into practice once again on the detective who has been seeing Ms. Kringle and that shock drives him just ever so slightly mad. It often feels as if the writers are stuck between writing the characters how they want them to develop, and how they think the fans want them to develop. Since this was only a photo, it definitely looks photoshopped rather than actual prosthetics. The arc of the episode that was handled quite well was the mystery involving the Ogre. Though I did think it was a little bit odd how he ended up with the nickname the Ogre in the first place. We find out in this episode that it’s a rather fitting nickname as he originally had a photoshopped deformity on his face before he became a ladykiller both figuratively and literally. The cops never knew what he looked like and I doubt that it would be a name that he would start himself. But that’s beside the point, Ventimiglia continues to handle the role quite well, both during his seduction of Barbary as well as the slight tics of a serial killer. And for once, Barbara actually gets to unwind and shed her extremely boring personality. First in the moment where she sheds off Gordon as being her boyfriend, inadvertently saving herself from an early death, and second when she does make her way back to the Ogre’s place. When she finds his little serial killer slash kink room, she isn’t horrified, but instead gets a smile on her face that ends the episode. It could go one of several different directions, and I’m honestly not sure which one I would care for the most. I don’t think that she should be able to get the drop on the Ogre, but I also don’t see having her become another victim as a good choice either. I think the most interesting direction would be to have her play along and actually enjoy it. What that “it” is, I’m not entirely sure. But I do think that would help give an edge to her character that has been completely lacking. Something that I hadn’t really noticed until now, and it makes me wonder if it’s something that has been seeded throughout the season and I have missed it until now. I have always enjoyed the cinematography in this show, but while I was taking screenshots, I happened to notice an extremely similar framing of Gordon and the Penguin. I would imagine that this symbolizes some sort of connection between the two characters, but I think I would have to go back a few episodes to really suss out what connection they are going for. It may even be something simple like how the relationship between Gordon and Leslie is just as unhealthy and doomed as the relationship between Penguin and his mother. To wrap up my thoughts on this episode, there’s also the matter of the Bat and the Cat. I thought they were actually nicely peppered in throughout this episode. It was a nice mix of lightheartedness with the moments of little Bat asking a girl to a charity ball and sending over a large amount of ridiculously awkward clothes, alongside the darkness of their discussion of how Cat killed a man last episode. It’s still a bit of too much too soon in terms of Catwoman being the antihero who can step over the edge when necessary while Batman will never cross that line even here as a young boy, but for the most part it worked, and I liked their teamwork in getting to the next step of Bruce’s investigation into the board member. All in all it was a good episode with only a few moments of taking it too far, and there were plenty of great looking shots, especially the moments at the charity ball.